Comics are as expansive and as diverse as prose, and there’s something available for any age group, maturity level, and interest. We’ve compiled a list of just a few titles to get you started, but there’s so much more to explore! Ask your local librarian or comic shop proprietor for their recommendations as well. *Age groups based on publisher classifications. If no age group is listed, the publisher did not specify an intended audience, so consult your librarian or comics bookseller for recommendations. Dragon Ball (series) Akira Toriyama VIZ Media Fantasy /Adventure All Ages Goku’s quiet life is disrupted when he meets Bulma, who is searching for seven Dragon Balls. Dragon Puncher (series) James Kochalka Top Shelf Action / Science Fiction All Ages Dragon Puncher is a warrior kitty in a robotic battle suit! Gon (series) Masashi Tanaka Kodansha Science Fiction All Ages The adventures of the last dinosaur on Earth. Johnny Boo (series) James Kochalka Top Shelf Fantasy All Ages Johnny Boo is the best little ghost in the world, and he’s got Boo Power! Owly (series) Andy Runton Top Shelf Fantasy All Ages A wordless comic series about an adorable owl and his worm companion. Winner of Harvey, Ignatz, and Eisner Awards. Princeless Jeremy Whitley, M. Goodwin, Emily Martin, Various Action Lab Entertainment Fantasy All Ages A teenage princess decides she’s going to forge her own path. My First Comics (series) Jennifer L. Holm and Matthew Holm Random House Humor 0+ Humorous board book series that introduces the youngest readers to comics. Babymouse (series) Jennifer L. Holm and Matthew Holm Random House Humor 7+ A humorous series about a young mouse trying to figure out school, friendship, and family. Squish (series) Jennifer L. Holm and Matthew Holm Random House Humor 7+ A humorous series with a dose of science about an amoeba trying to figure out school, friendship, and family. Amulet (series) Kazu Kibuishi Scholastic Fantasy 8+ Em discovers a magic amulet in her great-grandfather’s house, opening the door to a whole new world. Coraline: The Graphic Novel Neil Gaiman & P. Craig Russell Harper Fantasy 8+ Coraline unlocks a door to discover another home and another set of parents, whom she must escape to return to the real world. Winner of an Eisner Award. HiLo (series) Judd Winick Random House Science Fiction 8+ DJ and Gina befriend Hilo, a mysterious boy who crash lands on Earth. Nathan Hale’s Hazardous Tales (series) Nathan Hale Amulet Books History 8+ A graphic novel series that showcases major events in U.S. history. Secret Coders (series) Gene Luen Yang, Mike Holmes First Second Science / Mystery 8+ Great for kids with an interest in science and computers, this series combines logic puzzles and info about computer coding. Science Comics (series) various First Second Science 9+ Series that presents scientific information about various topics, including coral reefs, sharks, dogs, flying machines, and much more. Drama Raina Telgemeier Scholastic Reality-Based 10+ Callie deals with the on stage and off-stage drama of her middle school play. A Wrinkle in Time: The Graphic Novel Madeleine L’Engle, Hope Larson Square Fish Science Fiction 10+ The graphic novel adaptation of the adored novel, a tale of love, family, and physics. Bone (series) Jeff Smith Scholastic Fantasy 11+ Smith’s all-ages fantasy follows Fone Bone and his cousins on an epic Lord of the Rings-like quest. Winner of multiple Eisner and Harvey Awards. All-Star Superman Grant Morrison & Frank Quitely DC Comics Superhero 12+ Superman returns to the basics in this award-winning series that recaptures the charm and excitement of Superman’s best tales. Winner of multiple Eisner and Harvey Awards. American Born Chinese Gene Luen Yang First Second Reality-Based 12+ Jin Wang just wants to be an all-American boy, but a visit from his Chinese cousin causes him to transfer to another school to start over. Winner of the Printz Award and an Eisner Award. Black Panther (series) Ta-Nehisi Coates, Brian Stelfreeze, various Marvel Comics Superhero 12+ T’Challa, the king of Wakanda and the Black Panther, faces violent unrest in the country he rules. Boxers & Saints Gene Luen Yang First Second History 12+ A two-volume look at life in China in the late 19th century, during the Boxer Rebellion. Moon Girl and Devil Dinosaur (series) Brandon Montclare, Amy Reeder, various Marvel Comics Science Fiction / Superhero 12+ Lunella Lafayette, a preteen genius, befriends a giant red dinosaur. Ms Marvel G. Willow Wilson, Adrian Alphona, various artists Marvel Superhero 12+ Kamala Khan is a Pakistani-American New Jersey teen with a secret life as a superhero. Winner of a Hugo Award. Primates: The Fearless Science of Jane Goodall, Dian Fossey, and Biruté Galdikas Jim Ottaviani, Maris Wicks First Second Science 12+ A look three of the greatest primatologists — scientists who study apes — of the last century. This One Summer Jillian Tamaki & Mariko Tamaki First Second Reality-Based 12+ The first graphic novel to win the Caldecott honor, this coming-of-age story examines a summer of secrets, sorrow, and growing up. Winner of Caldecott and Printz Honors. Astro Boy (series) Osamu Tezuka Dark Horse Science Fiction 13+ The robotic Astro Boy battles a deadly underground tank, helps solve a murder, and prevents the world from being destroyed. Barakamon (series) Satsuki Yoshino Yen Press Humor 13+ Newly moved to a rural island, a curmudgeonly calligrapher befriends an exuberant young girl. The Best We Could Do Thi Bui Abrams Memoir 13+ An autobiographical account about a family’s escape from Vietnam to the U.S. in the 1970s. Planetes (series) Makoto Yukimura Dark Horse Science Fiction 13+ Follows a team whose sole job it is to clean up the space debris left by interplanetary travel. A Silent Voice (series) Yoshitoki Oima Kodansha Drama / Slice of Life 13+ An adolescent delinquent wants to redeem himself. Sunny (series) Taiyo Matsumoto VIZ Media Drama / Coming of Age 13+ Delves into the everyday lives, hopes, and dreams of a group of foster children. Two Faces of Tomorrow James P. Hogan, Yukinobu Hoshino Dark Horse Science Fiction 13+ Explores how much autonomy artificial intelligence should be given to manage world affairs. Wolf Children: Ame & Yuki Mamoru Hosoda Yen Press Fantasy/Romance 13+ The story of a boy who is part wolf and the girl who falls in love with him. Your Lie in April (series) Naoshi Arakawa Kodansha Drama/Romance 13+ A piano prodigy, who can no longer hear the piano, meets a violinist who might be able to help him. Akira (series) Kastuhiro Otomo Kodansha Science Fiction 16+ The lives of two streetwise teenage friends change forever when one develops paranormal abilities. All You Need is Kill Ryosuke Takeuchi, Takeshi Obata, Hiroshi Sakurazaka, Yoshitoshi ABe VIZ Media Science Fiction 16+ Alien invaders force humans into mechanical battle armor, in which they kill each other and are continually reincarnated. The Ancient Magus’ Bride (series) Kore Yamazaki Seven Seas Fantasy 16+ A powerful sorcerer engages a troubled teen as his apprentice and bride-to-be. Attack on Titan (series) Hajime Isayama Kodansha Science Fiction 16+ Humans in a post-apocalyptic wasteland battle the gigantic Titans. A Bride’s Story (series) Kaoru Mori Yen Press Historical / Romance 16+ As Amir and her husband adjust to their arranged marriage, she strives to find her role as she settles into a new life and home. Death Note (series) Tsugumi Ohba, Takeshi Obata VIZ Media Horror / Mystery 16+ Teenager Light Yagami finds a notebook that will cause the death of anyone whose name is written in it. Kurosagi Corpse Delivery Service (series) Eiji Otsuka Dark Horse Fantasy / Horror / Humor 16+ Five students at a Buddhist college start a business that fulfills the last wishes of the dead. Lone Wolf and Cub (series) Kazuo Koike, Goseki Kojima Dark Horse Action / Adventure 16+ The story of a disgraced samurai who, with his young son, seeks revenge on the clan that framed him for the murder of his lord. Real Account (series) Okushou, Shimizu Watanabe Kodansha Adventure 16+ The world of the most popular social networking game becomes reality. Vinland Saga (series) Makoto Yukimura Kodansha Historical / Action / Adventure 16+ Set in 11th century Viking-controlled England. Master Keaton (series) Naoki Urasawa, Hokusei Katsushika, Takashi Nagasaki VIZ Media Adventure /Mystery Teen Plus / 16+ A Japanese-English archeologist and insurance investigator solves cases and fights bad guys around the world. Pluto: Urasawa x Tezuka (series) Naoki Urasawa VIZ Media Drama / Mystery Teen Plus / 16+ A robot detective must find the elusive murderer behind a string of both human and robot deaths. Ranma 1/2 (series) Rumiko Takahashi VIZ Media Humor / Martial Arts Teen Plus / 16+ The gender-bending tale of martial artist Ranma. Real (series) Takehiko Inoue VIZ Media Drama / Sports Teen Plus / 16+ Three teenagers find a mutual love for playing basketball. Solanin (series) Inio Asano VIZ Media Romance / Slice of Life Teen Plus / 16+ Two recent university graduates seek solace and inspiration in music and life’s unpredictability. The Sandman (series) Neil Gaiman, various artists DC Comics Fantasy 17+ Gaiman’s epic tale of Dream and his siblings as Dream embarks on a quest to retrieve his objects of power. Winner of multiple Harvey and Eisner Awards. Barefoot Gen (series) Keiji Nakazawa Last Gasp War / Memoir Nakazawa’s classic memoir of the Hiroshima atomic bombing and its aftermath. El Deafo Cece Bell Abrams Memoir A semi-autobiographical look at being deaf in middle school. Winner of a Newbery Honor and an Eisner Award. Kitaro (series) Shigeru Mizuki Drawn & Quarterly Fantasy / Humor A lighthearted series about a young spirit monster. Lumberjanes (series) Shannon Watters, Grace Ellis, Noelle Stevenson, Brooke Allen BOOM! Box Action / Fantasy Five friends fight off monsters at summer camp. Winner of two Eisner Awards. March (trilogy) John Lewis, Andrew Aydin, Nate Powell Top Shelf Memoir / History The true account of Congressman John Lewis’s experiences during the Civil Right Movement. Winner of the National Book Award, two Eisner Awards, the Coretta Scott King Author Award, and the Printz Award. Maus Art Spiegelman Pantheon Memoir Art Spiegelman’s devastating account of his parents’ lives in concentration camps during WWII. Winner of the Pulitzer Prize and Harvey and Eisner Awards. My Little Pony (series) Various IDW Publishing Fantasy / Humor The comic book adventures of characters from the popular animated series and toy line. Nimona Noelle Stevenson HarperTeen Fantasy Minoan is an impulsive young shapeshifter and sidekick to a supervillain. Persepolis Marjane Satrapi Pantheon Memoir Marjane Satrapi’s coming of age story, set during the Iranian Revolution. Stuck Rubber Baby Howard Cruse DC Comics Memoir Howard Cruse’s semi-autobiographical story explores coming of age in the 1960s South and the search for identity. Winner of Harvey and Eisner Awards. The following journal articles and studies informed the creation of Panel Power and can be used to bolster your own knowledge of the benefits of comics. Afrilyasanti, Rida, and Yazid Basthomi. “Adapting Comics and Cartoons to Develop 21st Century Learners.” Language In India 11, no. 11 (November 2011): 552-568. Communication & Mass Media Complete, EBSCOhost (accessed October 8, 2017). Baur, Jack, and Jessica Lee. “Talking Comics.” Young Adult Library Services 10, no. 4 (Summer 2012): 17-21. Library, Information Science & Technology Abstracts with Full Text, EBSCOhost (accessed October 8, 2017). Christensen, Lila L. “Graphic Global Conflict: Graphic Novels in the High School Social Studies Classroom.” Social Studies 97, no. 6 (November 2006): 227-230. Academic Search Complete, EBSCOhost (accessed October 8, 2017). Hall, Justin R. “Books Worth Reading: Engaging Material–Comics in the Classroom.” Change: The Magazine Of Higher Learning 43, no. 2 (January 1, 2011): 39-43. ERIC, EBSCOhost (accessed October 8, 2017). Hallenbeck, Phyllis N. “Remediating with comic strips.” Journal Of Learning Disabilities 9, no. 1 (January 1976): 11-15. PsycINFO, EBSCOhost (accessed October 8, 2017). Hodapp, Albert Fred. “Turn Off the Television and Read.” Reading Improvement 53, no. 3 (Fall 2016): 114-120. Professional Development Collection, EBSCOhost (accessed October 7, 2017). Jimenez, Laura M., and Carla K. Meyer. “First Impressions Matter: Navigating Graphic Novels Utilizing Linguistic, Visual, and Spatial Resources.” Journal Of Literacy Research 48, no. 4 (December 2016): 423-447. Literary Reference Center, EBSCOhost (accessed October 8, 2017). Kim, Jimmy. “Summer Reading and the Ethnic Achievement Gap.” Journal Of Education For Students Placed At Risk 9, no. 2 (April 2004): 169-188. Professional Development Collection, EBSCOhost (accessed October 7, 2017). Lapp, Diane, et al. “Graphic Novels: What Elementary Teachers Think About Their Instructional Value.” Journal Of Education 192, no. 1 (January 2012): 23-35. Professional Development Collection, EBSCOhost (accessed October 8, 2017). Leaf, Justin B., et al. “Comparison of most-to-least to error correction to teach tacting to two children diagnosed with autism.” Evidence-Based Communication Assessment & Intervention 7, no. 3 (September 2013): 124-133. Communication & Mass Media Complete, EBSCOhost (accessed October 8, 2017). Low, David. “‘Spaces Invested with Content’: Crossing the ‘Gaps’ in Comics with Readers in Schools.” Children’s Literature In Education 43, no. 4 (December 2012): 368-385. Professional Development Collection, EBSCOhost (accessed October 8, 2017). Norcross, Matthew. “Aiding Challenged Readers.” Foreword Reviews 16, no. 2 (Spring 2013): 12. Literary Reference Center, EBSCOhost (accessed October 8, 2017). Palit, Jayashree. “Teaching Reading to ‘Babel’s Children’: Two Case Studies.” Research Horizons 4 (July 2014): 104-110. Academic Search Complete, EBSCOhost (accessed October 8, 2017). Pantaleo, Sylvia. “Language, Literacy and Visual Texts.” English In Education 49, no. 2 (Summer 2015): 113-129. Literary Reference Center, EBSCOhost (accessed October 8, 2017). Peters, Mike. “Dyslexics have more fun.” Journal Of Child Neurology 19, no. 10 (October 2004): 827-828. PsycINFO, EBSCOhost (accessed October 7, 2017). Pierson, Melinda R., and Barbara C. Glaeser. “Using Comic Strip Conversations to Increase Social Satisfaction and Decrease Loneliness in Students with Autism Spectrum Disorder.” Education And Training In Developmental Disabilities 42, no. 4 (December 1, 2007): 460-466. ERIC, EBSCOhost (accessed October 8, 2017). Ranker, Jason. “Using Comic Books as Read-Alouds: Insights on Reading Instruction From an English as a Second Language Classroom.” Reading Teacher 61, no. 4 (December 2007): 296-305. Literary Reference Center, EBSCOhost (accessed October 7, 2017). Rasinski, Timothy V., and Nancy Padak. “Who Wants to Be a (Reading) Millionaire?.” Reading Teacher 64, no. 7 (April 1, 2011): 553-555. ERIC, EBSCOhost (accessed October 8, 2017). Sivaratnam, Carmel S., et al. “Brief Report: Assessment of the Social-Emotional Profile in Children with Autism Spectrum Disorders Using a Novel Comic Strip Task.” Journal Of Autism And Developmental Disorders 42, no. 11 (November 1, 2012): 2505-2512. ERIC, EBSCOhost (accessed October 8, 2017). Stanley, Sarah, and Brian W. Sturm. “Sequential Art Books and Beginning Readers: Can the Pictures Help Them Decode Words?.” Knowledge Quest 37, no. 2 (January 1, 2008): 50-57. ERIC, EBSCOhost (accessed October 8, 2017). Sweeney, Sean. “Apps for High Schoolers With Autism.” ASHA Leader 18, no. 4 (April 2013): 34. Communication & Mass Media Complete, EBSCOhost (accessed October 8, 2017). Tilley, Carol L. “Reading Comics.” School Library Media Activities Monthly 24, no. 9 (May 2008): 23-26. Library, Information Science & Technology Abstracts with Full Text, EBSCOhost (accessed October 8, 2017). —. “Seducing the Innocent: Fredric Wertham and the Falsifications That Helped Condemn Comics.” Information & Culture 47, no. 4 (October 2012): 383-413. Library, Information Science & Technology Abstracts with Full Text, EBSCOhost (accessed October 7, 2017). —. “‘Superman Says, ‘Read!” National Comics and Reading Promotion.” Children’s Literature In Education 44, no. 3 (September 2013): 251-263. Professional Development Collection, EBSCOhost (accessed October 7, 2017). Topping, K. J., J. Samuels, and T. Paul. “Does practice make perfect? Independent reading quantity, quality and student achievement.” Learning And Instruction 17, no. 3 (June 2007): 253-264. PsycINFO, EBSCOhost (accessed October 7, 2017). Williams, Rachel Marie-Crane. “Image, Text, and Story: Comics and Graphic Novels in the Classroom.” Art Education 61, no. 6 (November 2008): 13-19. Professional Development Collection, EBSCOhost (accessed October 8, 2017). Boerman-Cornell, William, and Kim, Jung, and Manderino, Michael L. Graphic Novels in High School and Middle School Classrooms: A Disciplinary Literacies Approach (Rowman & Littlefield Publishers, 2017). Examines interdisciplinary applications of graphic novels in middle school and high school classrooms. Goldsmith, Francisca. The Reader’s Advisory Guide to Graphic Novels, Second Edition (ALA Editions, 2017). Provides background on the format and offers age-related reading suggestions and guidance for connecting readers with titles they will enjoy. Jaffe, Meryl, and Monnin, Katie. Using Content-Area Graphic Texts for Learning: A Guide for Middle-Level Educators (Maupin House, 2013). How comics enhance multimodal literacy in classroom settings. McCloud, Scott. Understanding Comics: The Invisible Art (Harper Perennial, 1993). A comic book about comics that explains how comics work, examines the history of the format, and explores their significance. Novak, Ryan. Teaching Graphic Novels in the Classroom: Building Literacy andComprehension (Prufrock Press, 2013). Offers specific tips for using comics in the classroom, including lessons, activities, discussion questions, and more. Pizzino, Christopher. Arresting Development: Comics at the Boundaries of Literature (University of Texas Press, 2016). Examines the legitimacy of comics and how the marginalization of the medium has influenced their creation and acceptance. Robbins, Scott, and Wildsmith, Snow. A Parent’s Guide to the Best Kids’ Comics: Choosing Titles Your Children Will Love (Krause Publications, 2012). Reviews and comics reading recommendations for Pre-K-8 readers. Syma, Carrye Kay, and Weiner, Robert G, editors. Graphic Novels and Comics in the Classroom: Essays on the Educational Power of Sequential Art (McFarland, 2013). 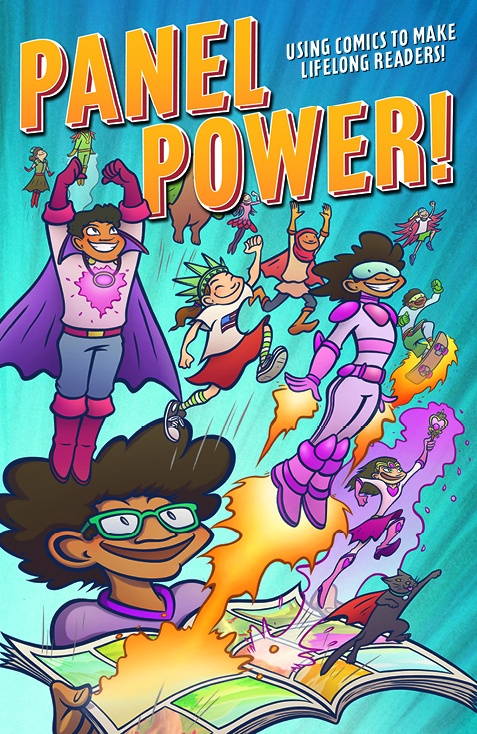 Essays about current practices using comics in classroom settings for all ages.